One of my favorite things about my Instant Pot is how quick it is to make a warming and healthy soup for my family that doesn’t take a few hours on the stove to reach the maximum flavor and tenderness. This soup is ready in less than 30 minutes which makes it perfect when you’re running low on time for dinner. I used my 6 qt. Instant Pot to make this recipe so if you’re using a larger pot, you may need to adjust accordingly. You can always check your owner’s manual to view the manufacturer’s instructions. In my 6 qt. pot, this recipe comes out flavorful and tender – it’s so good! This recipe is used making fresh ingredients and it makes it super flavorful! It also makes a great vegetarian meal – just omit the shell pasta if necessary! You can always substitute the shell pasta for more zucchini or carrots. And of course, omit the Parmesan garnish. 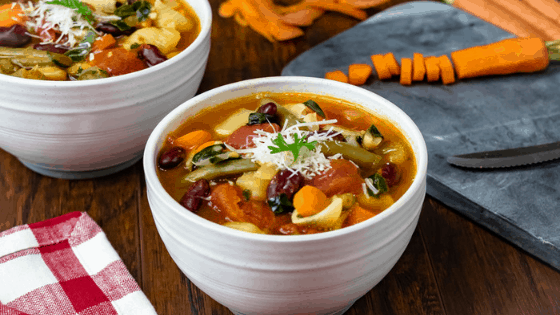 This recipe is based on the classic minestrone soup that is served at Olive Garden. It’s packed full delicious greens and veggies and this Instant Pot recipe easily serves 6! For my family, it’s not always ideal to sit and wait for up to an hour to eat in the restaurant or to order it to go. I personally love that I can make this restaurant quality soup in the comfort of home and have enough to serve the family. Turn Instant Pot to saute and pour in the 1 tbsp of olive oil. Saute onion, celery, zucchini, and carrots for 3-5 minutes. Turn off Saute and pour in the beans and green beans, followed by the tomato paste and the stewed tomatoes. Sprinkle the basil, oregano, garlic, and thyme on top. Pour in the 3/4 cup of shell pasta and top off with the vegetable broth. Cover with the Instant Pot lid and lock into place. Set to Manual for 6 minutes. Allow to NR for 10 minutes and then add in the fresh parsley and spinach.